In 1880 Vicent Roig Barberà also known as El Negre inherits from his father, Vicent Roig Mulet (1828-1883) one part of an estate located in La Vall de Blanco. Here he will build Mas del Negre, later know as Mas de Burot. He is therefore the first owner of Mas de Burot. The first records of the house date from 1897. Roig is a common surname in Horta de Sant Joan. The family that begins farming at La Vall de Blanco originally came from Mas de Sotorras in Els Reguers. Here Vicent Roig and his wife Paula Mulet had several children and Vicent Roig Mulet was one of them. It is thought that the father, Vicent Roig, originally came from the neighbouring areas of Matarraña or Morella and decided to attempt farming in Els Reguers. Around 1854 the son, Vicent Roig Mulet, married Sabina Barberá Aguilà from the village of Arnes and left Mas de Sotorras. He then built Mas de Blanco. The couple had three children. Their second child, also named Vicent, was born in 1858 and was to inherit part of the estate. It is here where between 1889 and 1897 he built Mas de Burot. Vicent Roig Barberà married Manuela Sebastià Andreu, a farmer herself from Mas de Vinyals. Vicent and Manuela had seven children but only four of them survived into adulthood. This was not unusual in times of high rates of child mortality. Joan-Baptista Lleonart Asensio (1890-1950) and Rosa Roig Sebastià (1894-1975). In the Burot farmhouse in the vicinity of 1949. In 1915 one of the couple’s daughters, Rosa, married Joan-Baptista Lleonart Asensio from the house of Burot and they became the second generation of owners. The couple met because they owned neighbouring plots of land at La Vall de Blanco. The Lleonart family owned a small estate between the Camí dels Ports and Les Gronses. This property still belongs to their descendants. 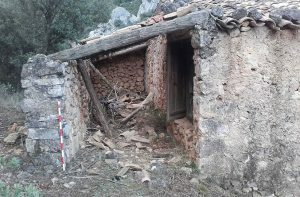 Joan Lleonart Cortés i Encarnació Asensió Roig. We can see reeds in the back, John dominated the craft of the cane and transmitted it to his son Joan-Baptista and his grandson Baptist. 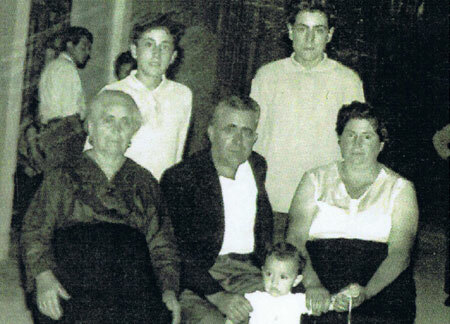 Rosa and Joan-Baptista had two sons, Francisco, born in 1917 and Baptista, born in 1920. Francisco, the eldest and therefore the heir, was going to be a herdsman at Els Ports until the beginning of the 1960s. At that time the council forbade herdsmen to carry out their activity in the communal woodlands. His brother Baptista lived in Mas de Burot until the age of 18. After the Spanish civil war and a long military service he married Emilia Navarro (1921-1988) and they always lived in the village in her parents’ house on what is now the Avinguda de la Generalitat. This house still belongs to their descendants. 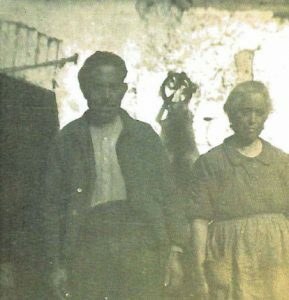 At certain times, including the tragic period from 1936 to 1942, Rosa would become a herdswoman in the absence of her sons. Mas de Burot was a stockbreeding farm from the beginning. They mainly kept goats because they were the most suitable species for this abrupt terrain with pastures but full of cliffs and gullies. Livestock keeping at Els Ports was limited to summer. The rest of the year, rain, snow, frost and fog would force herdsmen to travel to warmer areas. Herdsmen whose properties were within the limits of the massif did not have enough pastures to feed their animals therefore they needed the grass available in communal woodlands. Every year the council would auction the pasture areas. In order to get the rights over the pastures all herdsmen used to join together and elect a representative in order to deal with the council and gain control over the grazing areas. Distribution and uses of the spaces on the ground floor. In most cases herdsmen would wander far away from their houses and did not come back home when dark, instead they would spend the night in another farmhouse, in a cave or in a shelter. They usually went home only once or twice a week in order to get supplies. Livestock keeping at Mas de Burot began in 1896 with goats. From 1897 to 1903 they introduced some sheep. From 1904 to 1916 they came back to sole goat keeping. From 1917 to 1920 no records have been found at the council of any livestock keeping at the farm. During the Spanish civil war and the immediate postwar period they mainly kept sheep. This is because it was easier for the parents to keep a herd of sheep grazing around Mas de Burot than wandering around the massif with goats. We must not forget that their sons, Francisco and Baptista, were away at the war front and in the case of Baptista enduring a long military service after that. In 1943 Mas de Burot came back to normal life. The number of head of livestock increased and remained stable until the beginning of the 1960s when herdsmen at Els Ports were forced to leave the communal pastures. During the late postwar period Mas de Burot became one of the most important goat keeping farms in the council of Horta de Sant Joan. There was not very much cropping land around the house and this was distributed in small terraces. According to Baptista Lleonart they grew wheat, olives, almonds and grapevines. The resulting crops could hardly feed the family therefore they even had to buy some animal feed like alfalfa at Vall-de-Roures. Apart from that there were two other separate cropping areas; one of them was at Barranc del Salt, within the limits of the property, where they could get water from La Font Pülsenca and the other one was more distant from the farmhouse but still at Els Ports. The main crop here was potatoes. They were never hunters or trappers at Mas de Burot. They raised chickens and hens, rabbits and sometimes 1 or 2 pigs. They also kept 3 or 4 beehives. Information provided by: ‘El Mas de Burot. Història social i econòmica’ by Salvador Cardó Sabaté (2016). During the 18th and 19th centuries the council of Horta de Sant Joan privatized part of the communal woodlands within Els Ports massif by selling land to buyers. Later on in the 20th century, precisely during the 1960s, the council decided to revert to the former situation and in cooperation with Patrimonio Forestal del Estado they will start buying the same land they had previously owned from their private owners. PIn order to accomplish the purchase of all that land, in 1962 the council totally banned stockbreeding and wood cutting to farmers. To make things worse, a severe frost that took place in 1956 will cause a huge damage to trees in the cropping areas. 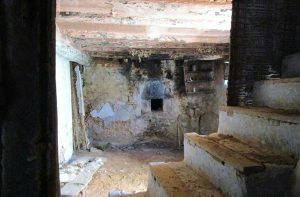 The combination of these factors forced farmers to leave and made of the council the main landowner in the province of Tarragona. By the end of the 1960s they were only two areas left in private hands. These were La Franqueta and La Vall de Blanco, location of Mas de Curassana , Mas de Blanco and Mas de Burot. Francisco Lleonart finally sold his estate to the council in two different transactions, the first one in 1965 and the final one in 1976. On January 15th 1965 and with permission from her mother, Rosa, he sold 8 hectares of their land. In the 1970s the council policy changed and unlike in the 1960s they were not interested in buying land. Nevertheless on October 28th 1976 and one year after Rosa died, Francisco sold the remaining part of the property to the council. That included the house and the surrounding land, another 8 hectares approximately. Many of the herdsmen who were forced to leave Els Ports had to find pastures somewhere else if they wanted to continue with their activity. Francisco reached an agreement with ‘El Don’, a landowner from the bordering council of Arnes, by which Francisco’s herd could join up El Don’s herd. Years later Francisco sold his herd to Rogelio d’Alfara who required Francisco’s dog as part of the deal. Francisco came back to Horta de Sant Joan with a small herd belonging to his mother. During this period he was going to have an enclosure with sheep at El Raval de l’Hospital. 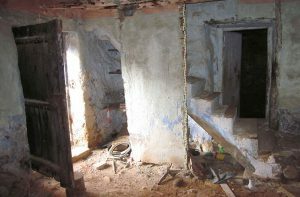 Later on and for the last stage of his life he moved to Mas del Gaire in the outskirts of Lledó. Before he reached the age of retirement he became ill and died in 1983. Francisco’s wife, Francisca died in 1987. Their eldest son Juan-Vicente will work as a lorry driver in La Senia and after that in the city of Tarragona where he retired. Their middle son, Salvador, married and went to live in Massalió in the region of Matarranya; He died in 2010 at the age of 60. Julio, their youngest son, found work in l’Hospitalet de Llobregat in Barcelona. All the three brothers had children but the surname Lleonart cannot be found nowadays at Horta. Family photo of 1962. Seated, on the left, Rosa Roig, in the middle of his son Francisco Lleonart and on his right, his daughter-in-law, Francisca Gavaldà. Rights his Savings Salvador and Juan-Vicente. *Information provided by: ‘El Mas de Burot. Història social i econòmica’ by Salvador Cardó Sabaté (2016).